× seven = fourteen Required Please enter the correct value. After another abrupt halt in Chinese stocks today (Thursday), investors were left wondering if a stock market crash is coming. China's stock market troubles led the Dow Jones Industrial Average to fall 300 points (1.8%) in early trading. While markets were extremely volatile today and more losses are likely, there will not be a stock market crash today. A stock market crash is defined as a sudden dramatic decline of stocks across a significant sector of a stock market. The result is a substantial loss of paper wealth. 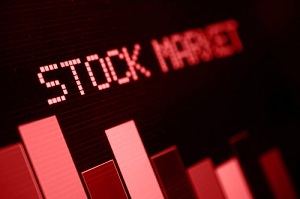 Stock market crashes are driven as much by panic as they are by underlying economic factors. On the economic front, worries continue to mount about a slowdown in China. The Asian nation has the world's second-largest economy and is a chief consumer of commodities. Emerging market currencies are in a tailspin, oil is trading at a 12-year low, and the Eurozone economy remains fragile at best. Behind the panic was the second halt this week in Chinese stocks. Just 29 minutes into Thursday's session, Chinese stocks were halted for the day after a 7.32% plunge. It was the shortest trading session in history for Chinese stocks after newly installed mechanisms to limit volatilely were again triggered. The aftershocks rattled markets worldwide. Hong Kong's Hang Seng declined 3.09%. Japan's Nikkei 225 sank 2.33% to a three-month low. The Stoxx Europe 600 was down 3.4% in midmorning trading, and Germany's export-heavy DAX sank 3.2%. Stocks in the United States also tanked. Minutes after Wall Street's opening bell, the Dow, S&P 500, and Nasdaq were lower by 1.4%, 1.4%, and 1.8%, respectively. While those losses are significant, they are by no means the cataclysmic drops that many investors associate with a stock market crash. Fears about China also spilled into commodity markets. Brent crude prices fell 2.4% to $33.40 a barrel. It's been a brutal opening for U.S. stock markets in 2016. The Dow Jones Industrial Average has logged its worst three-day start to a year since 2008. The S&P 500 and Nasdaq Composite posted their worst start to the year since 2001. Most of the blame goes to China, deemed the biggest threat to U.S. stocks this year. Investors expect further volatility to hit global markets as they look into Beijing's response to the rout for clues to the gravity of the country's economic problems. Also weighing on U.S. equities is the uncertain pace of the U.S. Federal Reserve's interest rate tightening. The central bank raised interest rates for the first time in nearly a decade in December and telegraphed additional hikes in 2016. Adding to investor angst, the World Bank on Wednesday cut its global growth forecast for 2016. It predicts emerging markets will struggle amid China's slowdown and the plunge in commodity prices. The international development institution downgraded its forecast for global growth in 2016 by 0.4 percentage points to 2.9%. That's down from its 3.3% forecast in June. Money Morning Global Credit Strategist Michael Lewitt warns that more losses could be coming for U.S. investors as these tensions mount. But that doesn't mean you should flee stocks.